Snow cover is an important component of the climatic system that affects both energy and moisture balance. The major control is over the absorbed solar radiation: any decrease in snow cover results in greater absorption of solar radiation and additional heat becoming available to melt the snow further. This classic albedo-temperature feedback, reproduced in all climate models, has been confirmed by many observational studies (e.g., Robock, 1980; Foster et al., 1983) including recently acquired data from Northern Eurasia discussed by Groisman et al. (1994a, b; 1997). In addition, melting snow pack is an important source of moisture and sink of energy. An unusually extensive snow pack keeps the temperature lower than normal because the heat of fusion, which is required to melt the snow, is not available to warm the ground. Melt water increases soil moisture and replenishes ground water reservoirs. The subsequent evaporation keeps the surface temperatures lower than normal. This combination of factors affects the atmospheric circulation on both local and synoptic scales (Ross and Walsh, 1986) and globally (Barnett et al., 1988; 1989). On average, the accumulation of snow begins in September in the north-east and continues until February or March. In April, melting begins and by May snow cover disappears everywhere apart from the Arctic and high mountains where it can remain throughout the year. The duration of snow cover depends primarily on the duration of subzero temperatures, increasing from south to north (Figure 3.13). The other main characteristics of snow cover are its spatial extent, depth, and density. These characteristics have been monitored by the standard meteorological network since the second half of the 19th century but, although spatial coverage has been expanding, it was inevitably incomplete. Satellite mapping of snow cover began in 1966 and, despite many limitations of satellite data, sufficiently accurate information is now available. Satellite observations between 1969 and 1982 have shown that, on average, Eurasian (including snow-covered areas outside the FSU) snow cover extends over 29 x 106 km2 (Foster et al., 1983). However, snow extent varies from year to year and the snow-covered area might be substantially different in the 19th and early 20th centuries and during the last two decades of the 20th century which, from the climatological point of view, was not a stable period. Indeed, Groisman et cd. (1994a, b) have found that the spatial extent of snow cover decreased by 10 per cent between 1972 and 1992. Temperature was found to be the main control over snow extent in marginal areas where it explains about 80 per cent of interannual variability. By contrast, in the regions of stable snow cover, where negative temperatures reliably persist throughout the winter, the most important factor is precipitation. Thus Eastern Siberia, which receives very little precipitation in winter, has a thin snow cover with an average depth of 30 cm (Rikhter, 1960; Barry et al., 1995). By contrast, the snow pack on the East European plain and West Siberian lowland has an average depth of 70 cm. The record snow depth is recorded at Mount Achishkho in western Transcaucasia where in an average winter snow depth reaches 400-500 cm (mountainous regions of western Transcaucasia have mild negative temperatures and receive the highest amount of precipitation in the FSU in winter). The relationship between the North Atlantic Oscillation (NAO), which is a major control over winter temperatures in Eurasia, and the extent of snow cover provides a convincing example of the significance of temperature control in transient and non-transient regions (Clark et al., 1999). During the positive NAO extremes, which correspond to the mutual strengthening of the Icelandic low and the Azores high, south-westerly flow over Europe and north-western Asia is strong and displaced northwards, leading to higher than normal temperatures in the north (Hurrell, 1995; Rogers, 1997). This positive temperature anomaly has little effect on snow cover across most of the FSU with the exception of the European south-west where the snow pack is least stable. Wind is another factor controlling the accumulation of snow. Blizzards and snow storms redistribute snow. These are particularly frequent in steppes. The combination of low winter precipitation and strong winds reduces snow depth and, consequently, lessens the insulating effect of the snow on winter crops. There is a strong positive feedback between snow cover and temperature in transient regions and in spring, across Northern Eurasia. Groisman et al. (1994a, b) estimated the currently observed reduction in the extent of snow cover may be responsible for the observed increase in spring temperature in the same region. The increase in surface air temperature, observed over the past hundred years, has been especially prominent over the land areas of Northern Eurasia in April and May (Jones and Briffa, 1992). This warming is likely to have been enhanced by the changes in snow cover extent. 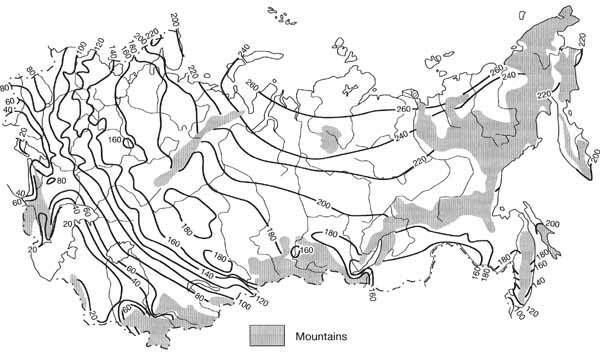 The earlier works by Russian climatologists focused on the synoptic aspects of the relationship between temperature and precipitation and the extent of snow cover in transient regions emphasizing the role of warm advection that suppresses snow cover. More recent studies linked temperature and precipitation patterns and variability in snow extent with larger-scale circulation anomalies. Studies of the links between the anomalous behaviour of the atmospheric centres of action are given in Gutzler and Rosen (1992) and Clark et al. (1999). In recent years much attention has been given to the role of the Eurasian snow pack in monsoon and El Nino—Southern Oscillation (ENSO) dynamics. The idea that the varying extent and thickness of Eurasian snow cover has an influence upon the summer monsoon is not new. Blanford (1884) was first to suggest that the summer monsoon over India and Burma might be affected by the snow cover in the Himalayas and went further to say that the relationship between winter snow and summer rainfall should involve 'major portions of the Asiatic continent rather than merely a relatively small portion of its mountain axis' (as quoted by Barnett et al., 1988,1989,1991). The mechanism, suggested by Blanford, is simple and appealing: the unusually extensive snow cover makes the ground colder than normal, therefore diminishing the land-sea temperature contrasts and delaying and weakening the summer monsoon. This concept was further developed by Sir Gilbert Walker (1910) who attempted the first quantitative links between snow cover and Indian rainfall. A wealth of literature was published at the end of the 20th century encompassing both observational and modelling studies including those by Hahn and Shukla (1976), Barnett et al. (1988; 1989; 1991), Sankar-Rao et al. (1996), Yang (1996), Bamzai and Shukla (1999), to name a few. These studies point at complex feedbacks between Eurasian surface processes, summer monsoon, and sea surface temperature anomalies in which Eurasian snow cover and the monsoon play an active role as opposed to being controlled by ENSO events that have been so far seen as pacemakers of interannual climatic variability.